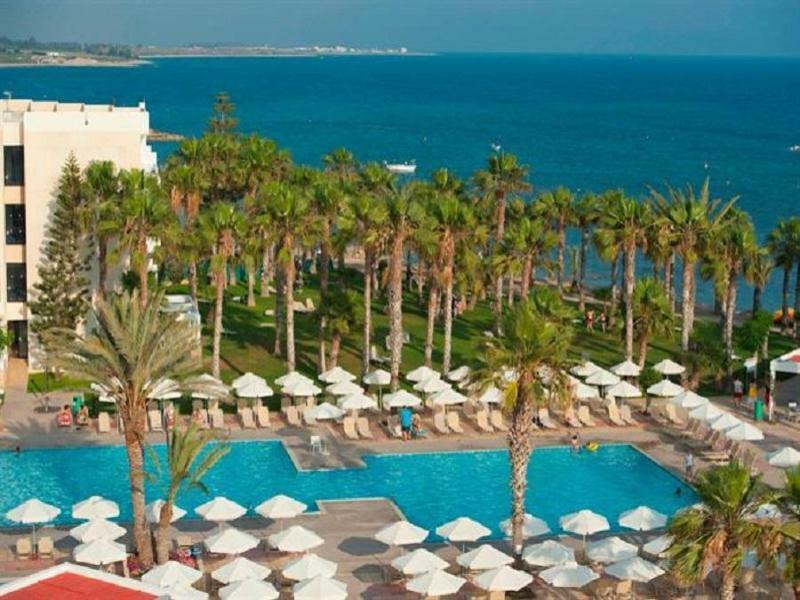 Louis Phaethon Beach Hotel Paphos, Cyprus holiday deals @Web2travel.co.uk. Online Since 2000. The 4 star plus Louis Phaethon Beach Hotel, is one of the top hotels in Paphos, by independent guest reviews. Great location on the beach. Quiet setting outside main resort. The rooms are spacious and very clean, and include a fridge, a hair dryer and great air con that works really well. Excellent food. Very friendly and hard working staff. Popular hotel couples, family groups and as a location for weddings and honeymoons. Very Good Value for Money. Book Package Holidays Online Louis Phaethon Beach Hotel, Paphos, Cyprus Direct with Top Tour Operator. Louis Phaethon Beach Hotel is located on the beach and approx 300 metres away from the Paphos Aphrodite Water Park. There is a shopping area approx 500 metres away as well as Go-Karts, horse riding and mini golf. There are many more bars and places to eat in the town centre (3km) and the medieval castle and harbour are approx 4km along the coast. The hotel is approx 9km from Paphos International Airport. There are 422 hotel rooms, comprising double/twin rooms and family rooms. Double/Twin rooms sleep up to 3 people and are furnished with a double/twin bed and either a sofa bed or single bed. Family rooms sleep up to 4 people and are furnished with a double bed and either 2 sofa beds or single beds. All room types have a bathroom with a bath or shower, a balcony or terrace and either inland views or sea views. They feature WiFi (local charge), satellite TV and music channel, a telephone, a fridge, a hair dryer, a safe box (local charge), heating and air conditioning (May to October). Louis Phaethon Beach Hotel has its own mini water park (May to October) which has a large swimming pool with 6 water-slides and a pool for children with a number of water games. Further leisure facilities and activities include an outdoor swimming pool, an indoor swimming pool (heated in winter), a sauna, steam rooms and a 20 seat jacuzzi, massage treatments, a fitness gym, 2 floodlit tennis courts, 2 badminton courts, basketball courts, a bowling green and short mat bowls, archery, beach volleyball, table tennis and billiards, a children’s playground, a bridge lounge and a TV lounge. The animation team organise a variety of sports and games during the day with regular shows and evening entertainment. is also a kids club and an infants creche. Social and dining venues include 3 restaurants, an Asian buffet bar, a pool-side bar and a lobby lounge bar. There are theme nights every day of the week such as Carvery night, Phaethon night, Gourmet night, Italian night and Cyprus night. Kids buffets and special menus are also available. The preferred dress code at dinner for gentleman is long trousers (November to April) and smart shorts or crop trousers (May to October). The Esperides restaurant offers buffets of Cypriot and international cuisine at breakfast, lunch and dinner. The China Spices restaurant has an outdoor terrace and serves buffets of Asian cuisine at lunch-time (summer only). Cafe Vienna is open from early morning to midnight for hot and cold drinks, cakes and pastries. Helios pool-side restaurant is open throughout the day for drinks and snacks with buffets at lunch-time (summer only) whilst, the Atrium bar serves drinks in the lobby lounge. Amenities and services available to guests include 24 hour reception, free WiFi in the lobby lounge, free baby equipment hire (pushchairs, sterilizers etc subject to availability), lift access to upper floors, a gift shop. There is also an internet corner, WiFi (rooms and public areas) a self-service launderette, currency exchange, car hire, an on-call doctor and baby sitting (all with local charges).